Our Pre-school room is set up to offer children lots of different learning opportuintes. All children are unique so the room offers calm areas, creative areas, a book area and of course, numeracy, literacy and science, so children can have lots of choice throughout the day. With lots of choice and opportuintes for the children our Preschool Room offers all areas of the curriculum. We also have some inovative resources which all the children love. Lots of time is spent outdoors where the children explore, investigate and burn lots of eneregy. There is a more structured approach in our pre-school room where our aim is to create a learning environment where the atmosphere is informal and fun. The equipment provided has been carefully chosen to enable children to learn through their play, build on their team work skills and also to develop a growing confidence and independence. Early I.T. also plays a part in the nursery class day and computer skills are developed with support and encouragement. The structure of the day is built around times of free play and free flow where the children are encouraged to make their own choices about where they want to play and learn; the staff will be on hand to observe and enhance the children’s learning. On a daily basis the staff will take separate groups of children for more focused group work, 'structured time'. 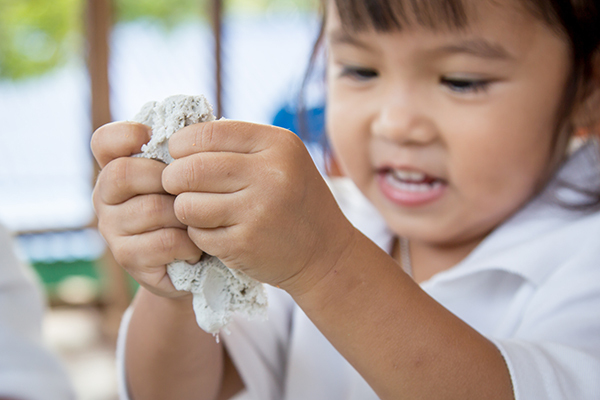 These activities are always play based to engage the children in what they are doing. We use literacy, numeracy and creative activities to enhance the children's learning. These skills are also nurtured in our book corner where children enjoy looking at books with friends. Circle time and group story time also forms an important part of the nursery day. In pre-school meal times are especially important social times where the children learn how to enjoy food and socialise. We always help children to practice good table manners. They use cutlery, serve themselves from serving dishes and scrape their own plates clean when they have finished. We encourage them to wait patiently before they begin, eat with their mouths closed, and no elbows on the table! The results are plain to see: pleasant meal times and happy children, both enjoying and contributing to the whole experience.